Back in April, I helped organize and participated at Edcamp Vancouver. I found it to be such an engaging networking and learning experience that in the days that followed I couldn’t help but rave to others about my experience. You can read my reflections here. When I spoke with Jonathan Kung (@coolpuddytat) and Nancy Gordon (@ngg37), both of whom participated at Edcamp Vancouver, we felt that the unconference model of professional development is something that our colleagues in Delta would be interested in and could benefit from. We quickly invited a few others, including Mark Douangchanh (@markdouangchanh) to join our planning committee and there we had it…Edcamp Delta was born! We quickly realized that the real work lay ahead! Our next questions were “Who will sign up?” and “Will we actually be able to attract enough participants to allow for rich discussion?” In the weeks and months since then our questions have been answered. 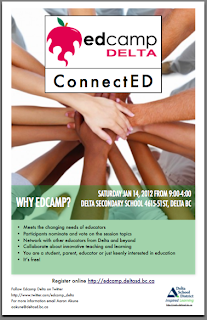 Over 110 people have signed up to attend Edcamp Delta. The majority of registrants are from the Fraser Valley and Lower Mainland areas of British Columbia, but we also have people signed up who are from Prince George, Cariboo-Chilcotin and as far away as Pakistan. Seeing these registrations come in confirmed for us that the word is getting out amongst educators. We needed to get the word out to our partner groups! We promoted Edcamp Delta to the Delta Youth Advisory Council (DYAC) and to leadership students at various schools. We spoke to District Parent Advisory Committee (DPAC) members and to various school Parent Advisory Committees (PAC). The result is we are seeing a healthy number of parents and a growing number of students register. As we continued to promote our event on Twitter we learned that there are three other Edcamp events (Edcamp Santiago, Edcamp San Diego & Edcamp Coquitlam) planned for the same day. · Participants in both countries will love the idea of connecting globally with other Edcamp participants. · Live interactive conversation will be the most engaging. · Participants will be interested to learn about the successes and challenges in education that others are experiencing in other parts of the world. · Networked participants such as those people who choose to attend an Edcamp will want to continue the conversations and sharing beyond the event. So, how are we planning to connect our Edcamps? To the best of our knowledge we are going to attempt something unique in the brief history of Edcamps. And this is what makes it so exciting! Each Edcamp is going to randomly select 4 or 5 volunteers to compose a discussion panel. In keeping with the unconference philosophy, each panel will be composed of people with a variety of perspectives and experiences in education. The intention is for randomly selected people to discuss their perspectives, not for ‘experts’ to share their research and beliefs. The topic of the discussion will be ‘Successes and Challenges in Education’. During the first of two global Skype sessions, the panel in Santiago, Chile will share their successes and challenges with and answer questions from participants in British Columbia, Canada. During the second global Skype session, the roles will be reversed. We anticipate there will be many questions, comments and some unbelievable stories shared! Each Edcamp will be setting up Skype connections that allow participants to have 1:1 conversations that stem from the Global Sessions or a Twitter conversation earlier in the day. We will also be creating a collaborative document where participants at both Edcamps can provide their names and interests. 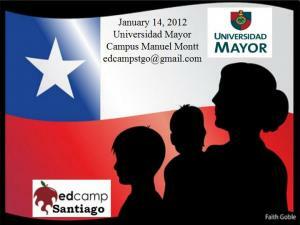 We hope that this enables Edcampers to connect locally and globally with people of similar interests long after Edcamp Delta and Edcamp Santiago conclude. So with all of these opportunities available at Edcamp Delta and Edcamp Santiago, if you are a student, parent, educator or simply possess a passion for education, I strongly encourage you to sign up for FREE for one of these events on Jan 14, 2012!